At Douch Family Funeral Directors, we care deeply about the residents in the Dorset community. This is why we offer grief support both in our branches and through bereavement support groups. We have been working with other members of the community on a project called Ferndown Community Connectors. This is for those copying with bereavement or loneliness & possibly lacking confidence, who need support to take part in local events again. We asked two of the ladies we are working closely with on Ferndown Buddies to share how this Dorset community group came to be, and how it can help offer support and improve the day-to-day of people’s lives. Ferndown is the fifth largest town in Dorset, with a population of nearly 20,000, incorporating the communities of Hampreston, Longham, Stapehill and Tricketts Cross. Ferndown adjoins the boundaries of the larger towns of Bournemouth, Poole and Christchurch and comprises of a large population of older people, aged 65 plus (35%). The majority of residents are in the age group of 16-64 (51%) and 40% of households in Ferndown have someone aged over 65 living in them. In a bid to combat isolation, sometimes a result of losing someone, and/or loneliness, a multi-organisational project called Ferndown Community Connectors evolved, involving organisations such as PramaLIFE, POPP Dorset County Council and St Mary’s Church. Other businesses involved include Penny’s Hill GP Practice; including Friends of the Practice, Orchid House, Turbary Road GP Practice, the Jolliffe branch of Douch Family Funeral Directors and a professional counsellor Cindy Weller. The need for this Dorset event arose after hearing similar stories of people being signposted to groups and clubs and, in some cases, even having transport arranged yet still not wanting to attend because they didn’t know anyone or have anyone to attend with. Ferndown Community Connectors is a short-term, low level “buddy/befriending” service that aims to connect people back with their community. 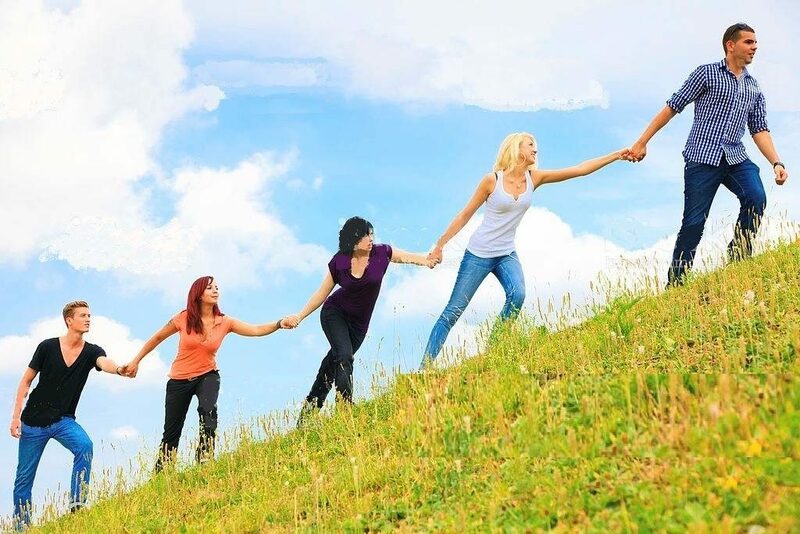 This could be for people who have lost their community connections because of a variety of reasons; such as, they became isolated whilst coping with bereavement or a recent move or change in circumstances or health resulted in a loss of confidence and/or motivation to explore what Dorset events are available in their local area. Someone wanting the service could be recovering from a period of poor mental or physical health, who has lost social connections and confidence and wants to go to the local coffee shop but not on their own. Ferndown Community Connector volunteers will work with that individual to support them, for example, in visiting the coffee shop with the volunteer; being their “buddy”. It could be someone who wants to go to a local eating opportunity but doesn’t want to go on their own as they feel separated from the Dorset community. Once there, they will make new connections, but they need that vital emotional support of going with someone for the first couple of times. All the Community Connector volunteers are fully trained, DBS checked and are committed to supporting local people to connect back into their Dorset community. Douch Family Funeral Directors and a professional counsellor are part of the team, should bereavement help, or grief support, be needed. To find out more about Douch Family Funeral Directors in Dorset or to speak to one of our friendly team about the Dorset events we organise, please contact us on 01202 367307 or find your local branch.